What a wonderful time we had in Torbay! What a lovely bunch of fun, silly, open, thoughtful, dancing humans! One of our favourite moments of working with you was on that very snowy Sunday. We were playing Shape for the first time and Joe goes to make a shape, running to the window and pointing out of it and shouting “SNOW”! Comic genius. And when we all danced to Rhythm is a Dancer for the first time and we saw everyone really let loose; Dan leaping, Nigel wiggling, Jade closing her eyes and feeeeeeling it! We were very moved when Erin stepped in for Dave, especially for what she said in relationship line. It was a moment that resounded with audience and cast alike. And we won’t forget the image of James and Daniel raving to “We are the children” in the outro music! Thank you so much for all you brought, we wept, we listened, we laughed and we danced so hard! Hip Hooray! “For me this project has shown me a new way of working with a community cast. The piece has artist integrity, but the process is equally important for the participants to reflect on fatherhood and relationships with fathers/father-figures. I feel that this is a model of best practice for participatory arts, in the true sense of the word. Having Dan and Dave in this project was very special. Particularly because they have never been on the stage before. They were both hooked into the project by the desire to want to spend more time with their children in a creative way. To do something physically active and to get a chance to have quality time with them. To share stories of their relationship with their own fathers too. This is ‘Dad Dancing’ and the title should give you comfort in the fact that you’re not expected to be any good at dancing! If you leave your inhibitions at the door and are willing to let the process lead you, then you’ll learn something new about yourself, perhaps a little about your relationships and feel a sense of satisfaction at the end. The most important things that you will bring to the project are your enthusiasm, your life experiences and your willingness to try something that may be a little out of your comfort zone. If I could say only one thing about this project it would be…..take part, you won’t regret it! This project was such a warm, challenging and affirming experience for me and my whole family. We began back at the first recruitment workshop with my husband and 9-year-old daughter attending together It was so much fun watching them come home buzzing and excited, practicing their whitney routines in the bedroom together. They both loved it. Then when my husbands dad unexpectedly had a heart attack just a week before the show, he was so gutted to not be able to take part. This was a really hard week for our family – -but my memories of it (which I will carry for a long time) were of being supported and held by the cast and especially by you three. You totally understood why Dave needed to pull out – and you also understood why I didn’t want my daughter to dance on her own. As a firmly-professed NON dancer, I was waaaay out of my comfort zone stepping in, but you made it so enjoyable. The facilitation was superb. You pushed us all to work together and make the show beautiful and you also honoured each of us with our individual strengths and foibles and challenges. This project meant that a week which held so much grief and sadness over my father-in-law’s death also was full of love and laughter and music and hugs and dancing. We all are so grateful for that – and for your ability to be both professional and sensitive/real in the space… a wonderful balancing act. Thank you to Doorstep Arts. Dad Dancing is touring to Doorstep Arts as part of the Collaborative Touring Network project. 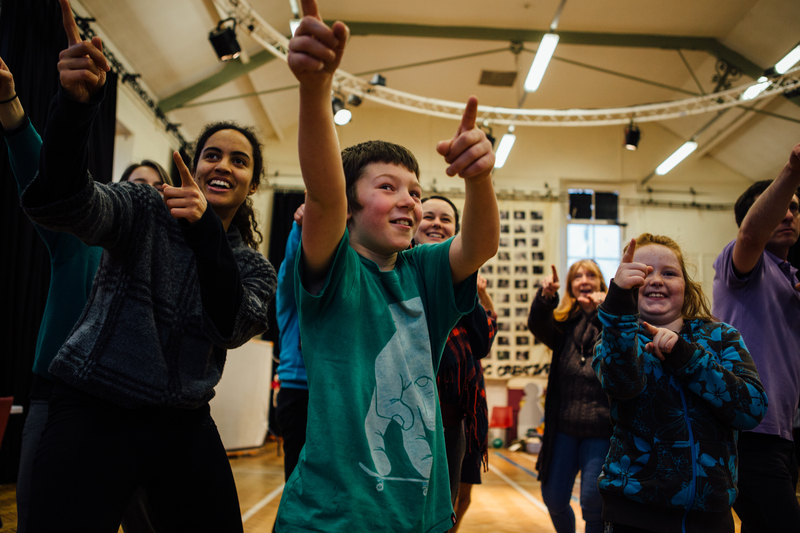 The Collaborative Touring Network is supported by Arts Council England Strategic Touring Fund, Esmée Fairbairn Foundation and Garfield Weston Foundation.